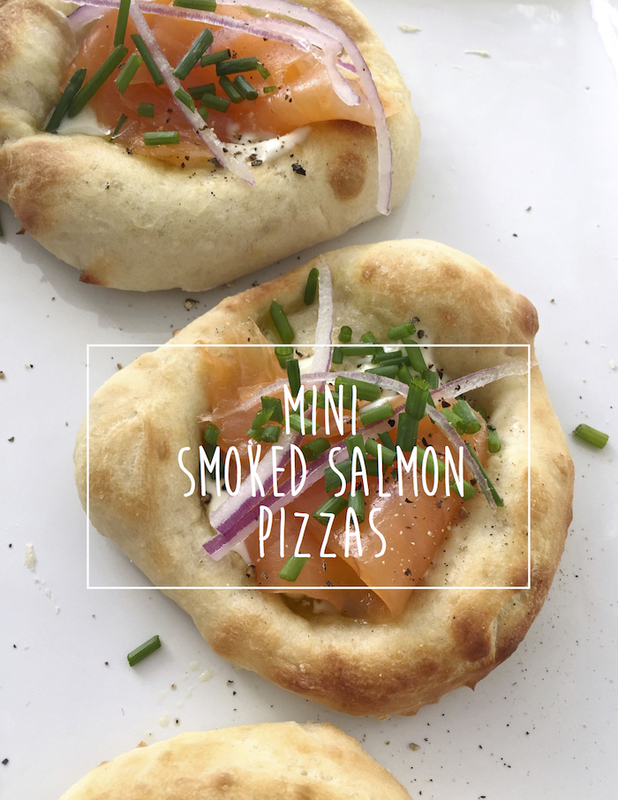 5-Ingredient Mini Smoked Salmon Pizzas—Fast Weeknight Dinner! / Hey, EEP! 5-Ingredient Mini Smoked Salmon Pizzas—Fast Weeknight Dinner! Gah! Happy belated New Year to you all. I hope you had an absolutely lovely holiday season—spending time with your family, eating too many cookies, smooching at midnight, all the good stuff! Now let's get back in the kitchen. I'm sorry it's been a while since I posted. A lot has happened since last we spoke. For starters: Boyfriend popped the question (!!!!!!!) and we're engaged xoxo OH. MY. GOD. I cannot wait to marry that guy. I'm still floating and giddy. Guess this means we need to start calling him fiancé on here, huh? Well, in honor of my new fiancé (still feels weird saying it) I'd love to share one of his fave recipes with you. I needed a quick after-work recipe to make on the eve of his 30th birthday. 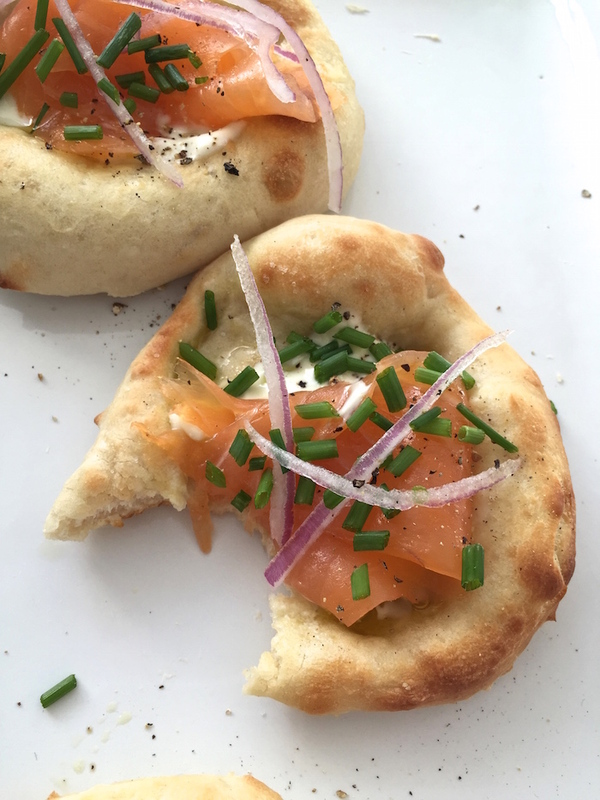 I was working in the Good Housekeeping test kitchen at the time and our brilliant food director, knowing his love of martinis and smoked fish, suggested I make a fast DIY pizza topped with cold smoked salmon and creme fraiche. SO smart! And such a hit. My 5-ingredient take on her recommendation has quickly become a weeknight staple in our home, not to mention a fabulous last-minute recipe for parties and surprise dinner guests. In fact, I just shared the recipe on Freutcake as a no-fuss New Years Eve appetizer. These teeny pizzas are absolutely divine with bubbly! 1. Put an upside down rimmed baking sheet in the oven and preheat to 500˚F—yeah that’s right! 2. Pinch off a small handful of pizza dough, then roll and stretch into 4-to-5-inch circle with the edges slightly thicker than the center; transfer to one large sheet parchment paper. Repeat with remaining dough (you may need to work in batches). Put the red onion in a bowl of cold water. 3. Brush pizzas with olive oil and sprinkle with salt. Carefully remove the preheated upside-down baking sheet from the oven. Slide the pizzas on the parchment paper onto the baking sheet; return to the oven and bake 5 minutes or until puffed and golden brown. 4. Top warm crusts with a few dollops of crème fraîche—let it get all melty and yummy! Top with smoked salmon, chives, few pieces of red onion and lots of freshly ground pepper.